The thing I like most about living in the ice belt is looking forward to the changing seasons. I think of these calendar events as fishing milestones. The changing of the seasons naturally rejuvenates our spirit and gives us the motivation and drive to get outside, stretch our legs and also to spend some time fishing. One of the many seasonal milestones I look forward to is the magic of first ice. It’s on first ice that the best hard water action of the year takes place. This magic extends to a host of different species, but in my mind nothing beats targeting crappie in December. I have a soft spot for crappie because this species is locally abundant. 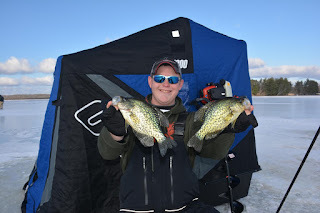 Within a 30 minute drive of my northern Michigan home, I can access half a dozen lakes that routinely produce limit catches of crappie on first ice. Over the years I’ve been blessed to be able to spend a lot of time with my family targeting these fish and making great memories. Crappie have a reputation for being hard to find and fickle to tempt into biting. 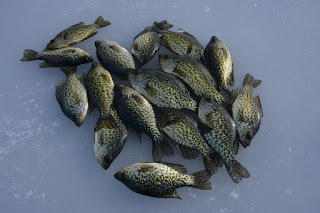 Actually crappie are pretty easy to get to bite compared to bluegills, sunfish and other popular panfish species. The problem with crappie is they can be tough to find. A big part of why crappie are elusive is because crappie tend to be found in different places in different lakes. For example, near my home is a small natural lake that features deep water very close to shore. On first ice we routinely find good numbers of crappie suspended near bottom in water from 20 to 30 feet deep. These fish are easy to find on sonar and they are also eager to strike almost any soft plastic or live grub I drop down. In fact these fish are so aggressive that I often rig up with a two jigs on my line. Catching a double header with a nice slab crappie on each jig is common. Meanwhile, at the same exact time a different lake just a couple miles away finds the first ice crappie bite taking place in about three to six feet of water among patches of cabbage weeds. The noise of walking around and drilling holes tends to scatter these fish, so we routinely start our day by cutting enough holes to keep us busy for a few hours of quiet fishing. After cutting all those holes it takes awhile for things to quiet down and for the fish to settle in before the bite starts. We’ve learned to be patient and wait for the fish to go back on the feed. first ice. Crappie use different habitats depending on the body of water. Assuming the fish will always be shallow on first ice is a big mistake. Crappie are where you find them and the only way to do that is to punch a lot of holes and cover as much water as possible. On first ice my spacious two man portable ice shack stays home and instead I fish from a ultra light one-man flip. My goal is to remain as mobile as possible taking with me just the gear I need including a portable sonar unit, a couple rod/reel combinations, a small box of jigs and tear drops, an assortment of plastic baits and live grubs, an ice auger and scoop. I rarely spend more than 10 to 15 minutes in one spot unless I’m lucky and sit down on a good sized school of fish. More often I find myself moving frequently picking off a fish or two here and a couple there. A typical morning or evening of fishing will require cutting about 10 to 20 holes. This kind of willingness to remain mobile is sometimes called “ice trolling” because the most successful anglers are constantly on the move. Those very anglers are routinely rewarded with the best catches. Clearly in crappie fishing there is a time to run and gun and a time to sit tight and be patient. This kind of knowledge only comes from experience and learning first hand what works best on any given body of water. In next week’s Fishing 411 blog part two of The Magic of First Ice will explore tactics for catching more crappie.